Once again two of my 5inch discus fish in trouble. I don't know what i am doing wrong, need help asap? White feces,loss of appetite,weight loss. One of them also been rapidly breathing. 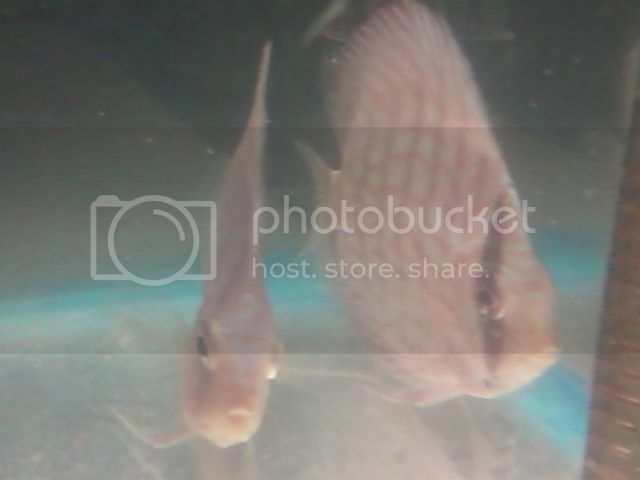 Moved them to Quarantine Tank (18(L)*18(W)*15(H)). Tank temp raised to 32c. Showed improvement so continued with salt treatment for another 5 days. Reduced water temp slowly on the 4th & 5th day by 2degree c.
Continued WC 40% daily for 7 days without adding salt. Showed sigh of improvement but still wasn't eating. Seem to react as i try to feed 'em maybe a one pellet sometime. So this time treated them with Metro with magnesium sulphate. Tank temp raised slowly back to 32c. Still no improvement. Also looks skinner . Fish :- 8nos. Discus now only 6nos. with 2nos. clown loach. Decor :- BB Tank with Driftwoods. I feed them Hikari BIO GOLD, Tetrabits,and hikari spirulina pellets. There fav. is Tetrabits, i 've to starve them to feed Hikari bio gold n spirulina. I do 've Seachem garlic which i add directly sometime to the tank water & sometime with tetrabits. They keeps on spawning in the main tanks. Although the hatch rate is very low only 5-10 frys, but dies as i am unable to take care of them . Wanna use API Aquarium Salt, need suggestion or magnesium sulphate ok? Where do i find praziquantel & how to use it. Also want to know about Azoo Anti Endoparasites, will it cure my ill discus fish? This is because of internal parasite.Please try de -worming your fish. Experts correct me if im wrong. @abhis9 - Thanks for keeping the tread going. @Prabha - I 've already used metro,its not helping. Why Magnesium Sulphate !! This is for stomach bloating. No use. Why Metro !! Are they doing white poo !! If no, Then no use. Actually the fishes lost their appetite. You have to treat them in different way. 1) You had not taken care of these discus properly . 2) May be you must have under feed your discus . 3) This discus may not be eating properly or completely neglected the feed for last 15-25 days . 4) Flagellates may be a problem , you should have catch the problem at the earlier stage . Now you can take a chance by feeding these discus with earthworms , just clean them chop them and feed them .once they start eating they may recover . 3. No idea about Azoo Anti Endoparasites. But I heard it is very effective. As you said white feces and loss of appetite, it is better to medicate the fishes using metrogyl tablet. Hope u know the process. If not let me know, I will send the detailed procedure which I am using. U can also try to give live mosquito larve so that they may show some interest in eating. try goat heart chops too. otherwise u can also use melafix very effective. Overall conclusion from my side is treat with metrogyl with epsom salt. @Shiva Nair - First of all,thanks for your reply. 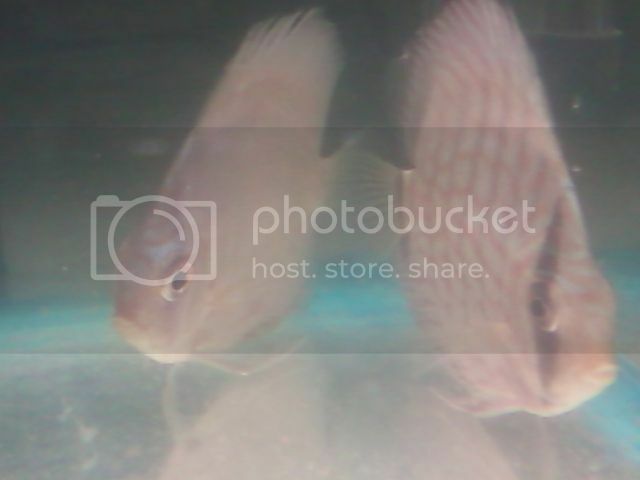 Yes i 've notice that, forehead of my discus has sunken. 1) Well i raised all my discus from 1.5inch juvi size. Maybe i did take care of them but not well enough as most of them dies with the same problem after 5 inch size.I 've lost 3 discus till now with same problem before. So trying hard to treat these two. 2) Under feeding is out of question here. 3) Yes,agreed. Tried different food but they neglected it all. 4) Yes,agreed. After lots of researched in google i know that its flagellates. I did treat them before with metro, they did recover but same problem returns. Will try feeding them earthworms. Can i try with frozen black worms with seachem garlic guard? 1)Put heater and maintain the water temp to 32 deg . 2)Dissolve Metro in warm water . 3) Dosage of Metro 1- 1.2 gm for 100 ltrs . 4) Every day do 50% WC and redose as above . 5) After 5 days stop the treatment . 6) Slowly bring down the temp to normal . 7) Give rest discus and start normal feeding , if possible with metro mix food . After a gap of 3-4 days again restart the treatment for another 5 days same as above . I forgot to ask has anyone used Azoo Anti Endoparasites & Azoo Magic treatment? How good & effective are they? Well Well Well.......So here it is. Supro don't waste anymore time. Just start feeding the eartworm as Shiva suggested. Yesterday I want say the same but waiting for master comments. Till now I have face the same problem and I able to solve it in 99% case. Also I suggested to my friends and they also able to save them. @Abhis9 - Thanks for your inputs. Well no one here in my place source live worms. Well that's the reason i asked if i could go for frozen black worms or can i feed them newly hatch - brine shrimps? No idea about frozen black worms. You can try "Today" frozen bloodworms. Brine shrimps....Can try out also.